Hello, esteemed subscribers! We promised you extras and by jingo you’re going to get them, whether you like them or not. 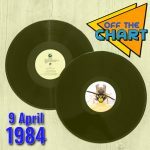 An extra bit from this week’s Off The Chart here, as Julian remembers swotting for exams in January 1988 and Steve relives his Christmas 1987 throat infection. Nasty.